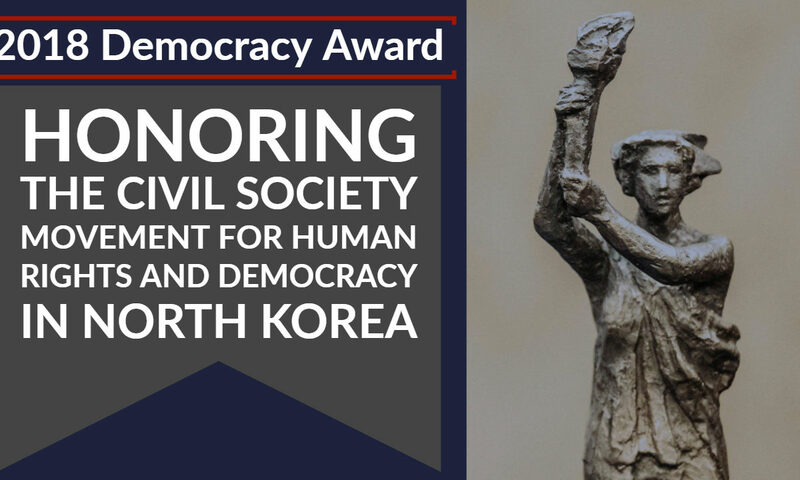 WASHINGTON, DC — Four Korean organizations working to document human rights abuses, empower defectors, and ensure the free flow of information in North Korea will be honored by the National Endowment for Democracy (NED) with the 2018 Democracy Award on June 13. The four groups represent a larger civil society movement for human rights and democracy in North Korea that will be recognized at a ceremony and reception on Capitol Hill from 5:00 – 7:00 PM in room 1100 of the Longworth House Office Building. Confirmed speakers at the event include Chairman of the House Foreign Affairs Committee Ed Royce (R-CA), and House Democratic Leader Nancy Pelosi. See brief descriptions of each organization and their representatives at the end of this release. Members of Congress confirmed to present the awards are Reps. Michael McCaul (R-TX), Joaquin Castro (D-TX), Stephanie Murphy (D-FL), and Peter Roskam (R-IL). NED Chairman Andrew H. Card, Jr. will chair the event. NED will also host a morning conference on June 13, “Beyond Pyongyang: Connecting with the People of North Korea” from 8:30 a.m. – noon at its office at 1025 F St, NW, 8th floor, Washington, DC 20004. The agenda features opening remarks by U.S. Ambassador-at-Large for International Religious Freedom Sam Brownback and U.S. Senator Ed Markey (D-MA), ranking member of the Senate Foreign Relations Asia Subcommittee. Two panels will feature expert analysis about recent developments with North Korea and the implications for the country’s human rights situation. The first panel includes former U.S. Ambassador to South Korea Mark Lippert, Jung Pak of the Brookings Instutution, Mike Green of CSIS and Georgetown University, and moderator Roberta Cohen of the U.S. Committee for Human Rights in North Korea. A second panel moderated by Washington Post columnist Josh Rogin will feature a conversation with the four honorees about their work to engage directly with the people of North Korea, what that work has yielded, and its potential to continue changing North Korea from within. Among the panelists will be Seong-ho Ji, who was praised by President Donald Trump in his 2018 State of the Union address. Other panelists are Sungju Lee of Citizens’ Alliance, Kwang Baek Lee of UMG, and Hubert Younghwan Lee of TJWG. These events are open to the media. Credentialed journalists must register in advance with NED public affairs by email: press@ned.org. The National Endowment for Democracy is a private, nonprofit, grant-making organization created in 1983 to strengthen democratic institutions around the world. It is active in more than 90 countries, supporting grassroots, democratic initiatives. More information about NED and the Democracy Award can be found at www.ned.org. The Citizens’ Alliance for North Korean Human Rights (NKHR) is the world’s first and oldest NGO devoted fully to the advancement of North Korean human rights. Founded in Seoul in 1996, NKHR has spread international awareness on human rights issues in North Korea by organizing conferences, concerts, and art exhibitions, and by establishing a network of NGOs to influence government policymakers and the UN. NKHR also runs education and resettlement programs for North Korean youth in South Korea. Bum-Jin Park is the Chairman of the Citizens’ Alliance for North Korean Human Rights (NKHR). Park has been part of the NKHR since 2006, and previously served as a member of the National Assembly of the Republic of Korea, President of Hansung Digital University, and a journalist. Sungju Lee is a consultant at the Citizens’ Alliance for North Korean Human Rights (NKHR). He is the author of Every Falling Star: The True Story of How I Survived and Escaped North Korea¸ detailing his defection in 2002. He is strongly interested in the unification of the Korean Peninsula, human rights, and rescuing North Korean refugees in China. Since 2010, Now Action & Unity for Human Rights (NAUH) has been working to improve human rights conditions in North Korea and achieve a unified Korean Peninsula. NAUH has spearheaded awareness campaigns on North Korea’s human rights conditions, organized campaigns calling for unification, hosted cultural exchanges between South and North Korean young adults, participated in radio broadcasts that relay news of freedom for North Korea, and helped rescue operations of North Korean refugees. Seong-ho Ji is the President of Now Action & Unity for Human Rights (NAUH). Since defecting from North Korea in 2006, he has participated in activities in various fields including human rights symposiums and cultural events in a bid to improve North Korean human rights and prepare for unification. Seong-ho gained international attention in 2108 when President Donald Trump hosted him as a guest at the State of the Union address, sharing his harrowing story. Shi-woo Choi is an administrative team leader at Now Action & Unity for Human Rights (NAUH). After defecting from North Korea in 2006, he became a foundation member of NAUH in 2010. His work focuses on the rescue of North Korean refugees in third countries. The Seoul-based non-profit Transitional Justice Working Group (TJWG) was founded in September 2014 to collect, document and visualize evidence of crimes against humanity in North Korea to support the ongoing effort to hold perpetrators accountable, and to bring victims’ needs and rights to mainstream awareness. Additionally, TJWG works on capacity building projects for Korean civil society. Hubert Younghwan Lee is the executive director and founder of the Transitional Justice Working Group (TJWG), designing projects and overseeing the operation of the organization. Lee has over ten years of first-hand research and advocacy experience on North Korean human rights issues, and has been engaged in training human rights activists in South Korea. Sehyek Oh is lead researcher at the Transitional Justice Working Group (TJWG). He left North Korea in 1999 and today interviews other defectors and victims of North Korean human rights abuses. Unification Media Group (UMG) is an independent multimedia consortium based in Seoul, comprising Daily NK, an internet periodical reporting on all aspects of NorthKorea; Radio Free Chosun, which broadcasts content targeting North Korean citizens; and Open North Korea Radio. UMG aims to provide residents of North Korea with credible, timely news and information, while reporting to the international community uncensored news from within the country. Kwang Baek Lee is the president of Unification Media Group and has over thirteen years of experience creating and broadcasting radio content for North Korean residents. His work has been cited by, among others, the Council on Foreign Relations, the Institute for Far East Studies, the Institute for Peace Affairs, and the Korean Association for Broadcasting and Telecommunication. Sang Yong Lee is editor-in-chief of Daily NK and previously spent a number of years working as one of the publication’s foreign correspondents in China, where he was subsequently detained with other North Korean human rights activists. He is also a North Korea analyst for a number of Korean Broadcasting System radio programs.